Countries around the world celebrate Arbor Day by caring for and planting trees. Internationally, the first ever Arbor Day was organised in 1805 in the small Spanish village of Villanueva de la Sierra by the local priest and an enthusiastic community. The custom, which was celebrated yesterday (April 25) in the United States, began in that country—in my home state of Nebraska—in April 1872. That’s when tree enthusiast and newspaper editor, Julius Sterling Morton, organised a day on which a million trees were planted. Morton became well known in Nebraska for his political, agricultural and literary activities, and President Grover Cleveland appointed him as Secretary of Agriculture. Morton is credited with helping that department change into a coordinated service to farmers, and he supported Cleveland in setting up national forest reservations. 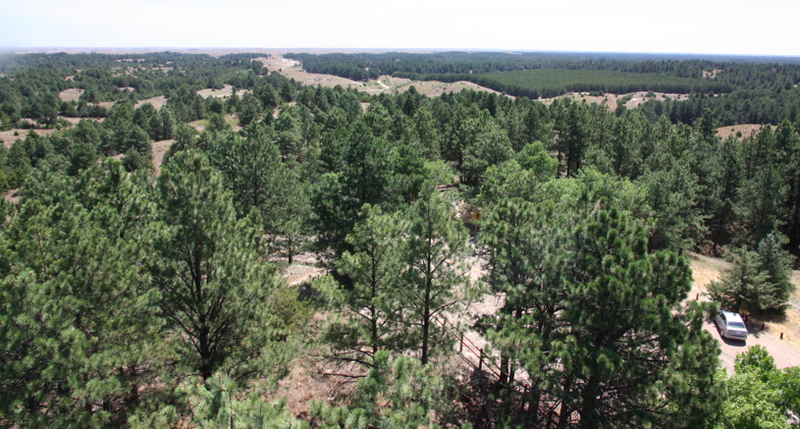 Which brings me to Halsey National Forest, or perhaps more accurately the Nebraska National Forest, in the state’s rolling sandhills. Established in the early 1900s, this forest was, until recently, considered the largest hand-planted forest in the world, with about 25,000 acres of trees planted since 1903. Poor John and I visited Halsey (I still call it that) last year when we drove northwest from Kearney to visit Valentine and Fort Niobrara National Wildlife Refuge. It took me back 40 years when I last visited to photograph the heartbreaking ravages of a major fire that destroyed, if I recall correctly, about 40 per cent of the trees. I don’t have any of those photos now, except in my mind’s eye, but it was gratifying to see the vast expanses of forest there today. 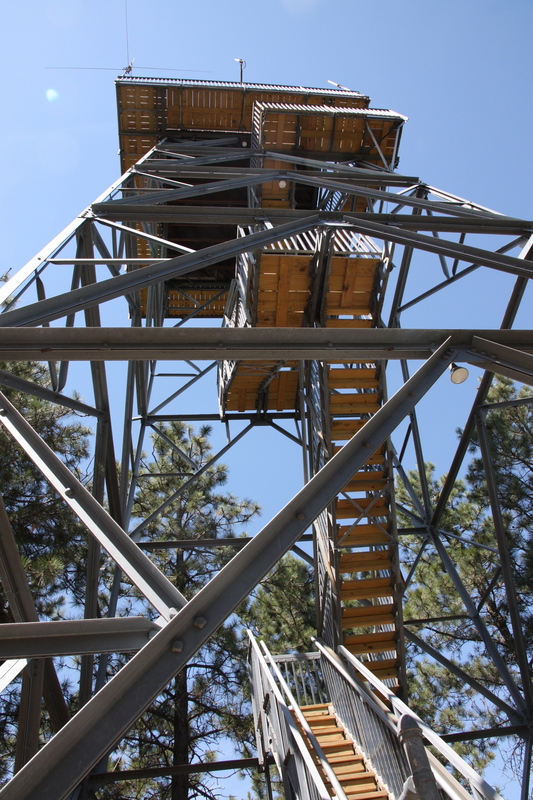 We climbed up the current Scott Lookout Tower, which was renovated a couple of years ago. It’s only 70 steps to the top, but it gives great views over the forest. And it made me proud to remember that Arbor Day in the US started in Nebraska. Dates for celebrating Arbor Day vary around the world and usually reflect the time of the year that is good for planting trees. G’day! Great to read Peggy and always enjoy learning more about US history! Thanks Joanne. Nebraska isn’t very well-known—even in the USA—so it’s nice to share some good news from the state. Very nice entry about Arbor Day and Nebraska, Peggy! My Dad helped plant trees in Halsey National Forest when he was a young man, more recently current generations have been planting more trees to help the forest re-birth after a fire. Drought has taken a heavy toll on Halsey as with many national forests. Your blogs are always appreciated, Peggy! Thank you! Thanks David. It’s nice to know about your dad’s connection to Halsey. The fire at Halsey definitely was a heartbreaker, as was the one at Chadron State Park, among others. The US Forest Service raises trees for such contingencies at Halsey, and has a major operation there for decades. They grow replacement tree seedlings from seeds harvested in many of the national forests and parks where the climate is similar enough to Halsey’s that the seedlings do well when transplanted. Those burns, though open up habitat for different types of birds and animals. Nature doesn’t remain static. Look at Yellowstone National Park, where a quarter burned back in the 1980s (was it? ): instead of over-grown forest, vast meadows for grazing animals were born. In time, they will becomes forested over again, through natural succession, but the fire was a renewal of that habitat. The wildflowers and grass were spectacular because of the ash from the fire that enriched the soil. Woodpecker populations increased to make use of the critters that worked on the decaying dead wood. Because of the fire, too, dead wood and underbrush that accumulated on the forest floor was “cleaned up”, eliminating a major contributor to the severity of the fire: Smokey the Bear, while promoting careful use of fire in the forest (“Only YOU can prevent forest fires!”), ironically created the circumstances where small regular burns didn’t clean the forest floor of material for fire, so large accumulations resulted in the bigger fire that consumed a quarter of the park. You’re right, weggieboy, fires bring change and opportunities along with the devastation. A huge fire swept across the Australian Capital Territory (where Canberra is) in 2003. Tragically, four lives, 500 homes, vast expanses of pine plantation and an observatory were lost. It was heartbreaking to look at the scarred land. But some good has come of this. In 2004, the ACT Government announced that 250 hectares of barren hills west of the city would be devoted to a national arboretum. It officially opened in 2013—we visited on that first day—and I need to do a blog entry on it. Happy Belated Arbor Day to you! Hi Uncle Tree, thanks for stopping by. Happy Belated Arbor Day to you too! Hi Peggy from David York’s friends Pat Worley Defa & Ray Defa……We met you at Confluence Park where the Platte meets Cherry Creek for a Greenway Foundation event. We introduced you to the mayor of the city….Michael Hancock. So glad David forwarded this to us as Pat was born in Lincoln and raised in Omaha (Westside High). Nebraska City was always such a fun car trip for the day to see Arbor Lodge and the history of Arbor Day! I remember getting fried chicken dinner from some little hole in the wall place either in Nebraska City or near there. I do not have my folks to ask about it any more so thought maybe you remembered or had been there for chicken? Ray & I volunteer for the Parks People/Denver Digs Trees here in Denver. We survey locations in the right of ways or parkways for spacing and if they can fit more trees than they order. They are distributed for planting on the weekend before Arbor Day at a handful of Parks & Rec locations around town. Very rewarding to see them grow through the years and know you had a hand in getting that tree where it is. Loving your adventures——take care, Pat and Ray too! Hello Pat and Ray — I sure do remember that Greenway event and meeting you both and the mayor. So glad Dave passed on the link to my blog, and really appreciate you stopping by. Can’t remember having fried chicken near Nebraska City, but my family certainly visited from time to time. My mum was crazy about the Pendleton Wool Mill outlet there, so that is my strongest memory. Canberra has tree planting events too, but nothing specific in the lead-up to our Arbor Day, which is always the last Friday in July. There’s also a program of street trees, with each street having its own type of tree. Very dramatic in autumn. I’ll have to get some pics to share here. Anyway, it’s great to have you join the adventures. If you put your email address in the follow box at the top right of the page, you’ll get an email whenever I post a new item. Or just stop back every few days.